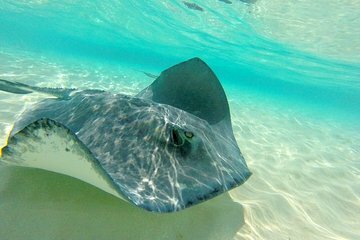 We signed up for a Stingray and Snorkel adventure while in Grand Cayman. We arrived on time to the port area to sign up for our tour and was told that one of their boats was "sick" so we would be joining another tour and would have to wait an hour before we left. When we were picked up by the bus, our driver asked if we where Christians and proceeded to school us in the Bible. This was not the time or the place for this. We arrived at the Marina and proceeded to wait another 30 minutes for the boat to arrive. The 2.5 hour tour that we signed up for ended up taking 4.5 hours. The beverages they offer are water and some sort of fruit juice that were in containers that had not been washed in quite some time. it stated on my reservations that there would be beer available for purchase. I inquired while on board but they said that was not available. We would have preferred to have a shorter tour leaving and arriving when we were originally told. If i were to go to Grand Cayman again, i would not do this tour again nor would i suggest to others. We were first taken to Starfish Cove since the stingrays hadn't come in yet. That was an extra treat! The stingrays were great, BUT a week after the trip they haven't emailed me the photo of us and the stingrays, even though we paid. And last, snorkeling is always fun, but there was very little to see, few corals and few fish. Enjoyed our trip with this vendor. Recommend using them for future trips. Snorkeling Reef Garden awesome. It was enjoyable and holding the stingrays was unique but it was a mob scene at the stingray sand bar. You'll interact with 1 stingray that your boat guide will get hold off. You will see a few other sting rays in the water but there will be quite a few boats there, each one somehow gets a stingray for their passengers and a photographer will take several pics of you with the stingray. Pics are expensive so if youre willing to chance your phone or camera getting wet, bring it with you and take your own pics. Also, not enough time for snorkeling. Overall, a unique experience and boat captain kept us on schedule since we were on tight schedule. I still recommend it but go off season if possible. We went on a new years eve cruise so maybe that made it extra crowded. Grand Cayman is geared towards tourists and cruise ships, so this tour was executed without a hitch. Yes, it's a very popular tour, so expect large crowds on the sandbar, but there is plenty of room for everyone. The tour operators are not keen to provide snorkeling gear even though our boat had it on board, but viewing is much better if you use snorkeling gear, so bring your own or insist that you use theirs. The so called coral garden where the snorkeling takes place is sparse, though attracts some fish and rays. We had a good time. The captain and crew were very nice. There were a few negative things that I will mention just so both the customer and tour group will know. We booked a morning tour. Was told at some point, that was 9:30. We were staying nearby the yacht club, so told them we would be there and not need to be picked up. Evidently, the 9:30 time was when they picked up at a hotel downtown. So we waited for an hour on the boat. Also, there was a photographer on the boat that took some staged photos with the rays. When she showed us the photos , her iPad screen was covered in fingerprints, so we could only assume they were ok. For 50, only a couple were ok. That was disappointing. We had been to Stingray City 35 years ago, and there were a lot more rays and not so many people. Our granddaughter enjoyed it, but that was also disappointing. The stop to snorkel over the reef was great because the coral was in better shape than the reefs that are close to shore. Most of the rest of the customers on the boat didnt really get into the snorkeling, so we only made one stop. The description of the tour said there would be 2 stops to snorkel. The price was fair, since we paid twice that for a Snuba experience that was only an hour total, including the instructions on land. It was fun to see up close the stingrays. This was a great time! The tour went a little long, but they were able to get those on cruise ships back on time. I saw a plethora of amazing sea life, and had an awesome time with the stingrays. My brother and I bought the photos from the photographer, as they came out pretty great, as well as had our own photos we took. The trip is BYOB, but they had water and juice for everyone on board. Will definitely do this again next time I am in the Cayman Islands.